In June 2011: Leaders from communities torn apart by Colombia’s internal armed conflict brought their stories to the UK and Ireland at the start of June and told our Governments what they can do to help. The delegation met with parliamentarians in the UK with ABColombia, CAFOD and SCIAF and in Ireland with Trocaire to present ABColombia’s May 2011 report, ‘Returning Land to Colombia’s Victims‘, which includes recommendations to the UK and Irish Governments and the European Union. Melida and Jesus Alberto reinforced the need for action through their own personal stories and experiences. Mgr Hector Fabio went on to Brussels with representatives from several Caritas agencies to meet with MEPs about the issue. We are asking the UK and Irish Governments and the European Union to ensure that British businesses do not profit from around 6 million hectares of land stolen by illegal armed groups; and, given the land situation and human rights violations in Colombia, that members of the European Parliament should refuse to ratify the EU-CAN Agreement with Colombia and Peru. That the British, Irish and European parliamentarians urge the Colombian government to ensure that land restitution and the rights of victims enshrined in international norms are adhered to in Colombia. The MPs, MEPs and Irish TDs that the delegation met with expressed a commitment to taking the issues forward in their parliaments and assured us that we would be hearing a lot about Colombia in the coming months. ABColombia and the delegation were extremely pleased with the meetings and events; which were well attended and demonstrated the continued preoccupation amongst British, Scottish and Irish politicians and the general public for the situation in Colombia. I was very generously welcomed into the homes and lives of people in Colombia during my recent visit there with Chris Bain, the director of CAFOD. It is my pleasure to reciprocate some of that kindness and generosity in welcoming Mgr Henao to the diocese of Middlesbrough and especially to our Cathedral. On Monday 6 June, the delegation visited Year 10 students at Trinity Catholic College, Middlesbrough, who were very keen to send messages of solidarity to young people in Colombia. On Wednesday 8 June, the delegation brought their cause to Westminster and met with officials of the Foreign and Commonwealth Office. 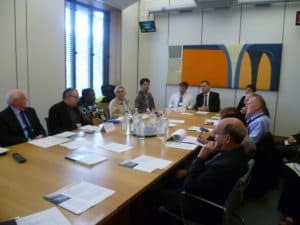 They later spoke at a meeting of the Parliamentary Friends of CAFOD (a cross-party group of MPs and Peers whose aim is to increase awareness among members of both Houses about the work of CAFOD and to support their work in tackling poverty overseas). Their main messages were that, while the Colombian Victims Law of 11th June 2011 offers some hope, ensuring that displaced communities can return to their land is fraught with risks, especially where illegal groups that have forcibly displaced them and are continuing to operate in the region; and where these lands have subsequently been passed on to, or sold to, companies – flouting Colombian law. Cocomopoca consists of 30 Afro-Colombian communities, Melida was here in the UK representing them; she informed politicians that AngloGold Ashanti had been sold approximately 50,000 hectares of the Cocompoca ancestral lands, without consultation with the communities and in contravention of Colombian legal procedures (the communities were in the process of registering these lands in their name). AngloGold Ashanti is a company registered on the British Stock Exchange; Melida was therefore asking the UK government and parliamentarians for their help. Several MPs expressed a commitment to taking the issues forward in Parliament and assured us that we would be hearing a lot about Colombia in the coming months. The visit of Mgr Hector Fabio, Melida and Jesus Alberto was a welcomed opportunity to help raise awareness on Colombia in Scotland. During a well attended seminar at Glasgow University, organised in coordination with the Glasgow Human Rights Network, both Melida and Jesus Alberto spoke passionately about life in their communities, their work as community leaders, and the challenges they face in the struggle to hold on to their land and their ways of life. They talked about the threat of mining and large-scale agriculture (such as palm oil and sugar cane, both used for bio-fuels), the foreign interests that often drive these forward, and how these activities are illegally forcing them off their lands and destroying Colombia’s natural resources. They also talked about the impact on them of the ongoing internal armed conflict, and the presence of different illegal armed groups in their regions. Finally, they spoke of their hopes for the future; and how they finally hope to receive the outstanding title deeds for their lands, and protection against future illegal incursions. The delegation also visited St Benedict’s High School in Linwood, Paisley, where they met a class of 15-16 year old RE (Religious Education) students. The students were invited to compare life in Scotland with life in Colombia, through the stories and messages brought to them from Colombia. An extended question and answer session gave them the opportunity to find out more about the challenges faced by people their own age in rural Colombia, and they were encouraged to take an active interest in Colombia. The Caritas and ABColombia visit to Ireland was a useful opportunity to raise awareness of the situation in Colombia, particularly the situation regarding land and victims. In Dublin the delegation visited the Irish parliament where they made a presentation to a group of TDs. The presentation was presided over by the chairs of the parliamentary committees on Foreign Affairs and Trade and of European Affairs: Deputy Pat Breen TD and Deputy Joe Costello TD. Deputy Pat Breen had visited Colombia in October 2010 as part of a Trocaire organized delegation. The Minister of State for Development and Trade, Deputy Jan O’Sullivan T.D., was also able to attend the briefing. In the evening the delegation spoke at a public event, organized by Trocaire and the Latin American Solidarity Centre. The event was well attended and the audience was very engaged and asked a number of thought provoking questions. After an early departure from Dublin on Friday 10 June the delegation arrived at Trocaire’s office in Belfast,Northern Ireland. While Monsignor Henao and Louise Winstanley (ABColombia Programme and Advocacy Manager) prepared for advocacy meetings with Bairbre de Brun MEP, Jim Mitchell MEP and Naomi Long MP, Jesus Alberto and Melida took a political tour of the city, given by former paramilitaries from both the Republican and loyalist sides. Visiting the Falls and Shankill roads as well as a memorial to some of those who died in Northern Ireland’s ‘troubles’, they learned about Northern Ireland’s bloody history and the processes it underwent to establish peace; along with the current issues Irish people confront in order to maintain that peace. Later in the day, Jesus Alberto and Melida met with the trade union NIPSA who, through their global solidarity work, have been very active on raising awareness of the situation of human rights violations in Colombia. Jesus Alberto and Melida also met with the Northern Irish Human Rights Commission to learn about the human rights situation in Northern Ireland and the work of the Commission in promoting human rights in Ireland. Mgr Hector Fabio Henao Gaviria is Director of the Social Department of the Colombian bishops’ conference/Caritas Colombia, and CAFOD’s main partner in Colombia. Mgr Henao coordinates a network of offices throughout Colombia that seek to translate into practice the Church’s work for peace and reconciliation, the defence of human rights and assistance to victims of the conflict. His department provides emergency food, shelter and advice for the displaced. Through its offices around Colombia, it also tries to give vulnerable communities the protection and support they need to live normal lives in this situation. Mgr Henao has been a key figure in the development of this work, and in winning support for it from the worldwide Catholic Church through the Caritas Internationalis network of humanitarian agencies. The increasingly bitter conflict has cost the lives of many church personnel. Mgr Henao himself had to spend several months in London after threats were made against his life. Melida Esther Guevara is an Afro-Colombian community leader from the Department of Choco in Colombia. Choco has a diverse geography and is rich in natural resources however its remains the department with the highest levels of poverty in Colombia. Melida belongs to the Community Council of the People’s Peasant Organisation of Alto Atrato (COCOMOPOCA) which has been fighting for land titling since 1999. The 1991 Colombian constitution recognised the right of Afro Colombian communities to their ancestral territories, however many communities are still struggling to get this land registered to them. Jesus Alberto Castilla Salazar is a peasant community leader and a member of the National Agrarian Coordinator (Coordinador Nacional Agrario) and the Social Integration Committee of Catatumbo (Comite de Integracion Social del Catatumbo – CISCA). He has been an active community leader fighting for the restitution of land stolen by illegal armed groups. As a result of his work he has received a number of threats and unfounded legal charges have been brought against him. For ABColombia analysis on the Land Restitution Chapter of the Victims Law and further information on Cocomopoca see: ABColombia, ‘Returning Land to Colombia’s Victims’, May 2011.